The last baby bibs you will ever buy! Product Features: 1.Perfectly designed to combine the benefits of soft fabric with durability of silicone, easy to clean and antibacterial. These bibs are machine washable and quality will not comprise. 3.You will find these bibs made with much higher quality silicone than most brands. They are thicker, stronger and FREE of BPA and Silicone ODOR. 4.Unisex design and adjustable soft button straps perfectly fit for babies aged 10 months & onwards. 5.The bibs can be rolled up with toddler utensils into the deep pocket providing easy portability. Order now to get this last baby bibs you will ever buy. FRONT POCKET OPENS WIDER THAN OTHER BRANDS - Effective at holding its shape to catch food and liquids without spilling out. Made with 100% food-grade silicone. GUARANTEE-Our bibs come with a LIFETIME GUARANTEE-We use our bibs too and we know sometimes accidents just happen so we have you covered Simply contact us at any time. 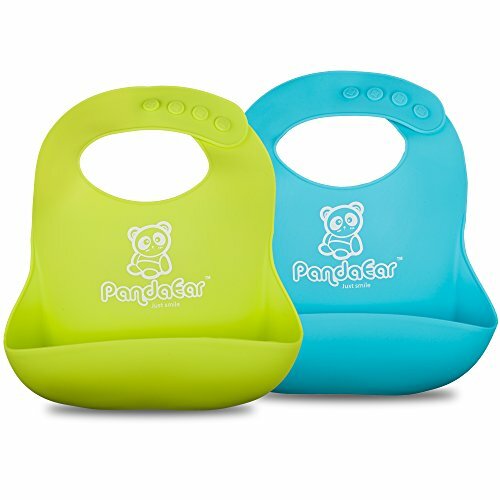 If you have any questions about this product by PandaEar, contact us by completing and submitting the form below. If you are looking for a specif part number, please include it with your message.